A species of jellyfish called Turritopsis nutricula utilizes a cellular process called transdifferentiation to effectively live forever. The process tends to be used by animals like salamanders to regenerate lost or injured body parts. 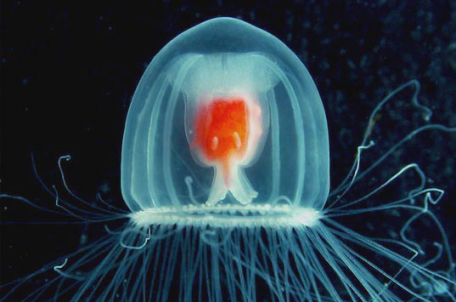 The Turritopsis nutricula, however, can use the process to completely revert themselves into a polyp form, restarting their life-cycle. Research was published in 2008 showing that this ability has allowed the jellyfish to survive long trips in ballast compartments on cargo ships. They’ve therefore been able to silently invade the world’s oceans and have been observed in the Atlantic, Pacific and Mediterranean. Harnessing this process would be a boon to Extropianism, a philosophy that includes the hope that humans will one day be able to live indefinitely. On top of this goal, perhaps their ability to colonize distant seas could be a helpful model in the service of “directed panspermia,” a process Michael Mautner has claimed, in the Journal of Cosmology, to be a moral obligation.